Our pizzas are cooked in a traditional stone deck oven, not on a conveyor belt or in a microwave! The items listed above take 20-30 minutes to cook properly! We serve no pizza before its time! 10 minute pizza’s taste like the box they are served in! 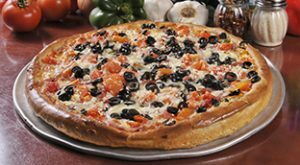 Enjoy a fresh, traditional pizza from Kelsey’s Pizza! 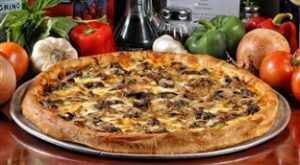 Pepperoni, green peppers, cheese, sausage, ground beef, mushrooms, and anchovies upon request. 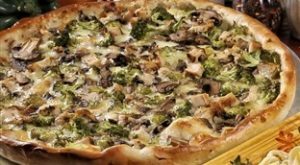 Chicken, broccoli, mushroom, Alfredo & cheese. Thinly sliced steak, onions, mushrooms mozzarella, and yellow cheddar. Drizzled with A1 Steak Sauce. 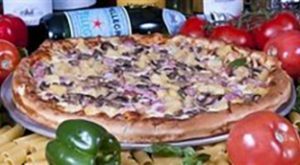 Canadian Bacon, green peppers, mushrooms, and pineapple. 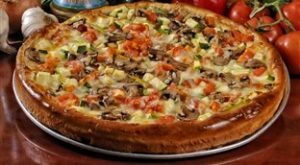 Sliced onions, green peppers, cheese, fresh (not canned) mushrooms, tomatoes, and zucchini. 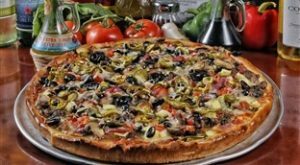 Pepperoni, sausage, ground beef, ham, green peppers, onions, mushrooms, black olives, zucchini, tomatoes, jalapeños, salami, Canadian Bacon, and cheese. 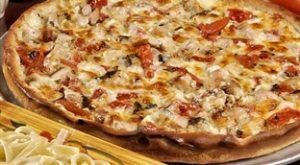 This pizza is highly addictive! Made with homemade Alfredo sauce, grilled chicken, seasoned diced tomato, and cheese. 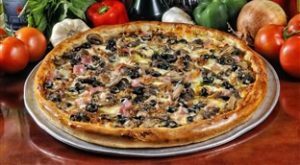 Pepperoni, sausage, ground beef, ham, onion,green pepper, mushrooms, black olives, and cheese. 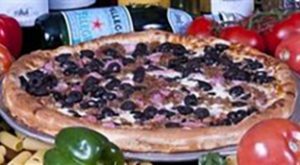 Pepperoni, sausage, Canadian Bacon, onions, and black olives. Pepperoni, green peppers, onions, tomato, salami, feta, and black olives. Extra virgin olive oil, garlic, ricotta, spinach, onion, feta & cheese. Green peppers, fresh mushrooms, sliced black olives, jalapeños, banana peppers, pepperoncini, zucchini, diced tomato, garlic, roasted red pepper, broccoli, spinach, and onion. Pepperoni, mild Italian Sausage, ground beef, ham, Genoa Salami, Canadian Bacon, meatballs, roasted rope sausage, and bacon, *sliced steak, *chicken. (*Denotes extra charge on pizza toppings). We make our dough daily on the premises using a premium flour – Kyrol…..and Extra Virgin Olive Oil as one of the ingredients. Our dough is not shipped in from an out of state commissary. 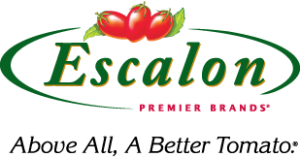 We make our pizza sauce using premium tomatoes on the premises – Escalon. 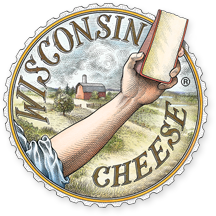 We use a blend of REAL part-skimmed mozzarella and white cheddar from Wisconsin that we grind on the premises daily. 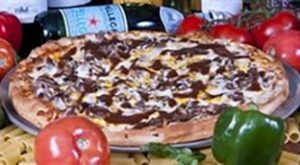 We use REAL ground beef on our pizza’s seasoned with salt, pepper, garlic and oregano and not a “beef topping”. We use REAL sausage on our pizza’s made with ground port, salt, pepper, garlic and fennel and not “pork topping”. We then cook the sausage to remove the fat and grind it before adding it to your pizza. We use REAL bacon on our pizza’s and not a bacon topping. We slice our vegetables on premises daily. Our pizzas are cooked in a traditional stone deck oven and not on a conveyor belt or in a microwave…….because a great pizza takes time to cook! 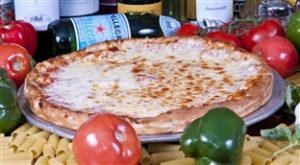 When your pizza calls for Alfredo sauce….it is our homemade Alfredo sauce, made with real butter, heavy cream and Pecorino cheese and NOT a sauce out of a bag, a can or a mix. 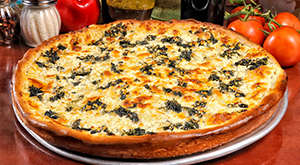 When your pizza calls for garlic…it is fresh garlic and not garlic powder.